Let the new Alameda restaurant introduce you to cold-skin noodles. 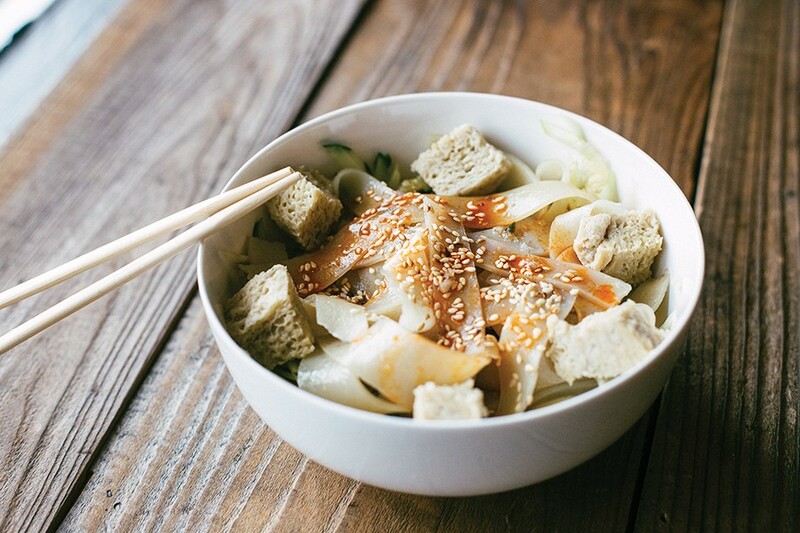 The cold-skin noodles are served with cucumbers, bean sprouts, and spongey gluten. Until I met Larry and Tammy Lu, I had never heard anyone call running a restaurant "relaxing." 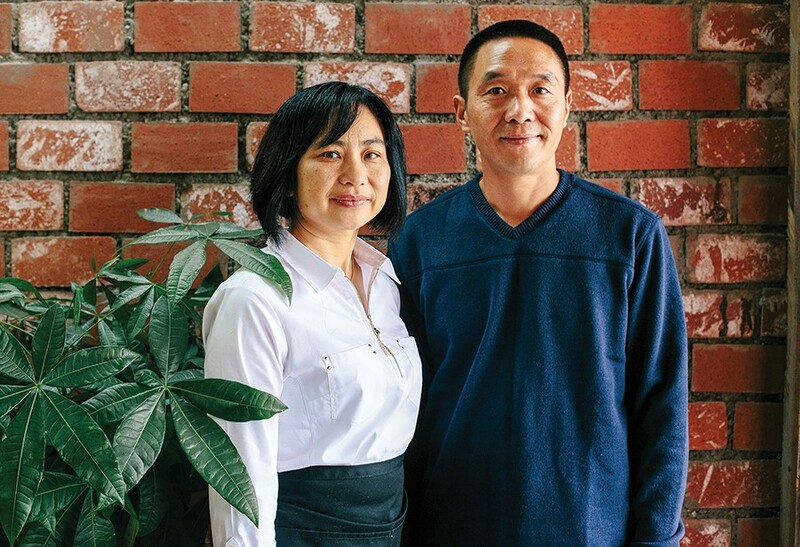 The couple opened downtown Alameda's Wild Ginger in July, about two years after moving from San Francisco to Alameda and 20 years after immigrating from China. In San Francisco, Larry owned an importing and exporting business, and he wanted to transition to something with a shorter commute and fewer hours — and again, something "relaxing." "We just make sure to enjoy the customers and ourselves," Larry said. Considering Wild Ginger is open for lunch and dinner six days a week and that Larry and Tammy do just about everything by themselves — well, let's just say we have different definitions of "relaxing." At the restaurant, you'll find Larry in his Chinese-style, paper chef hat folding dumplings by hand or firing orders of noodle soups glowing red from chili oil. Tammy hustles admirably as the restaurant's sole front-of-house staff. This sweet husband-wife team alone makes Wild Ginger the sort of low-key, family-run business you want to root for. The food stands on its own, too. Larry's mother was from the Sichuan province in eastern China and suffused his upbringing with numbing spices. That's why Wild Ginger serves mala tang, a style of street food that originated in Sichuan. But the bulk of the menu is actually Shaanxi-style, specifically inspired by the province's capital city, Xi'an. It's a refreshingly short selection: just six noodle dishes, two dumplings, the mala tang, rou jia mo, and a few nibbles like spicy duck necks. Larry specifically highlighted this as a main goal for his restaurant — to make a few items really well and ignore the pages of Americanized fare that clutter so many other Chinese restaurants in the Bay Area. In other words, there's no General Tso here. Tammy and Larry Lu opened their first restaurant this summer. The food of Xi'an is relatively unknown in the inner East Bay. Xi'an Famous Foods in New York catapulted Xi'an's hand-pulled noodles and cumin-dusted lamb to national fame, but the only other local spot that specializes in it is Famous Bao in Berkeley. Wild Ginger unfortunately doesn't stretch its own noodles by hand, but it does make liangpi in-house — a dish you'd be hard-pressed to find anywhere else in the area. Larry said it takes five hours to make liangpi, otherwise known as cold-skin noodles. The process involves rinsing dough with water and allowing that resulting, starchy water to rest until it separates. One of those layers resembles a paste, which then gets steamed in a thin layer and sliced into noodle-like ribbons. They're satisfyingly chewy yet soft, served cold and doused in soy sauce, black vinegar, garlic, and chili oil. Julienned cucumbers, bean sprouts, and spongy cubes of gluten add heft, but the overall effect is cool, light, and refreshing. It's a great vegan option on a primarily meaty menu. My favorite dish, though, is the pork zha jiang, a bowl of springy, fresh noodles topped with a fermented soybean paste and ground pork — comforting, deeply savory, and a steal at $6.99. On a menu where nothing tops $9, basically everything feels like a steal, though. Because of the large Muslim population in Xi'an, lamb and cumin have become common ingredients. I longed for even more cumin in Wild Ginger's spicy cumin lamb noodle soup, though it was still plenty delicious and benefitted from those same thick, chewy noodles. For those who prefer thinner varieties, the beef vermicelli is a soother, packed with star anise and a subtle earthiness that reminded me of a good Taiwanese beef noodle soup. The handmade dumplings, floating in spicy-sour soup, are another great option. Try the lamb, which retains a slight gaminess that contrasts nicely with the soup's tang. For a big meal, you can add noodles, too. You can also get cumin lamb in a rou jia mo, most commonly known stateside as a "Chinese burger." It's a beloved street food in Xi'an. Slowly stewed, spiced pork is the most common filling, and I did prefer Wild Ginger's soft, succulent pork version to its lamb. Either way, the meats get stuffed in a soft English muffin — Larry said he tried making the bread, which is typically a crisp, pan-fried and steamed flatbread, but it required too much time and labor. The English muffins are the closest thing in the United States that he could find. I haven't tasted rou jia mo in China, but I have tried it at a couple of other Chinese restaurants in California and found the more typical pita-like bread quite dry. The English muffin may not be traditional, but it soaks up the meat's juices and works well enough for you to get the idea. Wild Ginger's final specialty, mala tang, translates to "numb spicy heated." With origins in Sichuan, it's now a popular street food all over China. Basically, you choose a bunch of items — wood ear mushrooms, beef balls, cabbage, and so forth — which then get cooked in a spicy broth all together. It's somewhat like hot pot, though Larry does the assembly for you. The final price is calculated based on the items you choose. Hours: Tue.–Sun. 11 am.–2:30 p.m., 4:30–9 p.m. The Chai Thai Noodles family expands with a hip restaurant on Piedmont Avenue.